Photo by Flickr user adamthelibrarian. 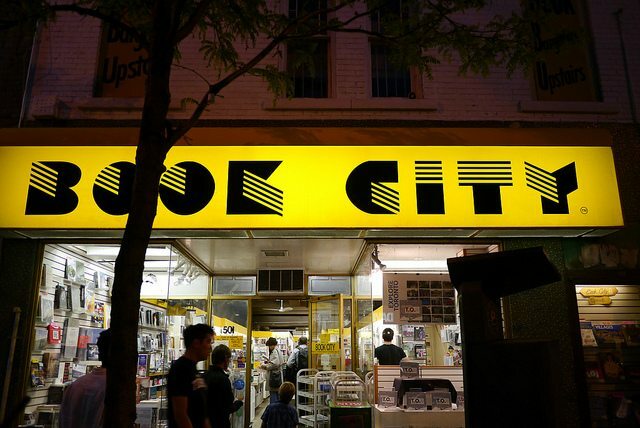 Yesterday afternoon, Book City announced that after a 38-year run, its flagship store at 501 Bloor Street West will be closing this spring. “The lease was up, and we agonized over the decision,” general manager Ian Donker told Quill & Quire, “but sadly it didn’t make much sense to continue.” It will be the second iconic Toronto book retailer to close this year, after the World’s Biggest Bookstore shuts its tills next month. Born in the Netherlands, store founder Frans Donker came from a family that ran a publishing firm. “I am third generation in the book business if you count my grandfather Willem,” he told the Star in 2001. “He was a liberal Christian minister who wrote bad novels about poor farmers’ sons falling in love with the girl in the mansion.” Donker moved to Canada in 1969 and worked for the Classic Bookshops chain and publisher Fitzhenry and Whiteside before opening Book City with his wife Gini in 1976. Advertisements, the Globe and Mail, October 13, 1979 (left), the Globe and Mail, October 20, 1979 (right). The store found its niche selling a wide variety of non-mainstream paperbacks and quality remainders. Early ads touted its selection of mystery and sci-fi titles, and deals that weren’t restricted to weekend specials. As one ad boasted, “You can come down to Book City and pick up an armful of bargains any day. Or any evening.” Spread across two floors connected by narrow staircases, browsers were pointed upstairs by a sketch of a dapper bearded gent. For a child discovering bookstores, it was fun to run across the creaky upper floor. For adults, the store provided a relaxing place to browse new titles and explore the latest cheap finds. Nino Ricci had been in my store, a bit shy, but very likeable, telling us that his book was coming out. A small publisher came to us later and presented the book. I read a chapter, one of my buyers read a chapter, and we agreed, this is darn good stuff. So we decided to put ourselves behind the title, and instead of five books for the shelves, we bought 50 for the tables, and recommended it to people who came into the store. They too liked it and told friends, and it started to snowball. I completed the book, loved it, and promoted it even more. Sadly enough, not enough booksellers supported it. To celebrate the store’s 15th anniversary in 1991, Donker commissioned a novella starring writer Howard Engel’s detective Benny Cooperman. Engel’s story, The Whole Megillah, included a scene in which the suspects met on the upper floor of Book City. Advertisements, the Globe and Mail, November 3, 1979 (left), the Globe and Mail, November 17, 1979 (right). 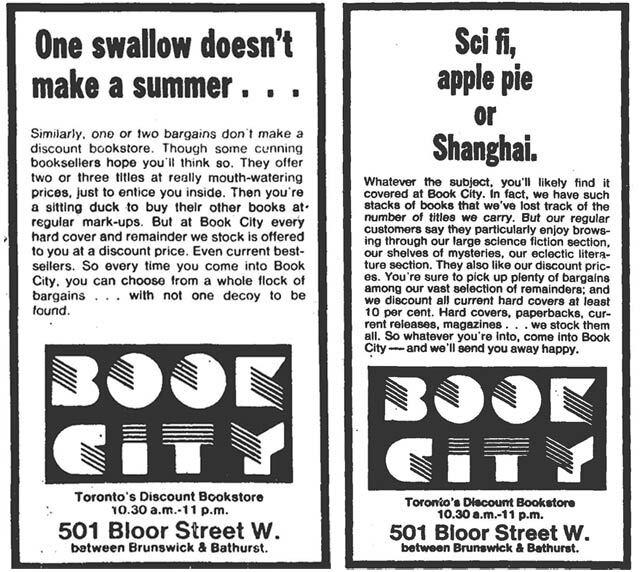 During its first decade, Book City frequently violated provincial Sunday shopping laws. While David Mirvish sold remainders on the Lord’s Day thanks to Mirvish Village’s tourist designation, Donker was fined whenever he opened his doors. For a time in the early 1980s, Donker exploited a loophole that allowed businesspeople to declare Saturday as their Sabbath. The result: the main floor was open Monday through Saturday, while the upstairs became The Book Loft, and operated Sunday through Friday. Until the laws were fully relaxed, Book City received periodic warnings to play nice. 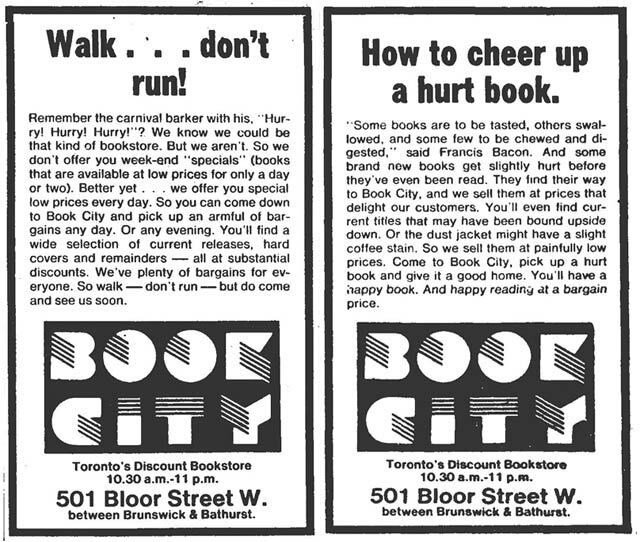 Book City became a chain when it opened its second location at 663 Yonge Street in 1984. The number of branches has varied over the years—at its height, six stores operated across the city, and regular warehouse sales took place in Leaside. The chain held its own during the onslaught of superstores like Chapters, while other independents folded. Donker prided himself on his close relationships with suppliers, and believes Chapters harmed itself by not cultivating such ties (they “destroyed publishers by demanding every last nickel”). The chain’s three remaining locations at 348 Danforth Avenue, 1950 Queen Street East, and 1430 Yonge Street will stay open. Expect plenty of reminiscences over the next few months, as the Annex store joins the list of local bookstores that will live on in customers’ memories. Additional material from the November 3, 1979 edition of the Globe and Mail, the June 1992 edition of the Metropolitan Toronto Business Journal, and the June 18, 1977, January 12, 1981, October 23, 1991, August 8, 2001 editions of the Toronto Star.